all this by making music so beautiful it brought tears to the eyes of other musicians. In 1924 the Dobbs brothers left the Creole Jazz band believing that King Oliver had skimmed money from their cuts. Lil Harden, who was by now Louis Armstrong's wife, urged Armstrong to leave the band also. Although reluctant to leave King Oliver , Armstrong gave in to his wife and left for New York City to join the Fletcher Henderson band. Henderson had one of the leading bands in the country but his musicians were locked to the beat as were all the leading players. 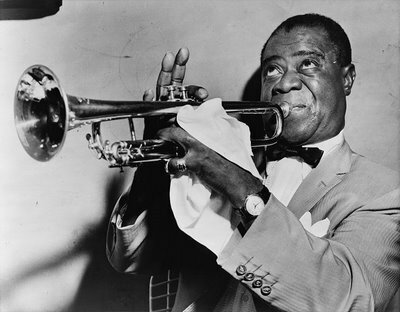 Louis Armstrong came in and played in the legato style placing notes before and after the beat. He brought a blues feeling and technique to music. In other words, he began to swing and to use blue notes. Coleman Hawkins was Henderson's star tenor saxophone player and he had been playing a slap tongued on the beat style. Responding to Armstrong's influence, Hawk began to play a legato style and he also began to swing the beat. Don Redman was arranging most of Henderson's music and he also responded to Armstrong's influence. His arrangements became less corny and then stopped being corny and they began to swing too. Although Armstrong was not the featured soloist in this band, he was given solos to play. However, Henderson would not let him sing. While in New York Armstrong also recorded backing several prominent blues singers including Bessie Smith. And he recorded with a small group led by New Orleans native, Clarence Williams. The Clarence Williams Blue Five recordings put Louis Armstrong in the studio with another legendary New Orleanian, Sidney Bechet . The rapid development of jazz can be heard when the two leading jazz virtuosos of that time trade solos on "Cakewalking Babies from Home". These legendary giants compete with each other in both swing and soul and the result is the best jazz played to date. In 1925 "Pops" left New York and returned to Chicago and his wife Lil Harden and a band she had at Chicago's Dreamland Ballroom. He played the Dreamland Ballroom and later the same nights played with Erskine Tate's pit band at a Vendome Theater. He spent time sight-reading tunes based on operatic arias and playing in a stage band. In addition to these two full time gigs, Armstrong also made recordings. In November, 1925 Armstrong formed a group called the Hot Five. This group was not a working band and existed only for the purpose of recording. Much of the group came from the Creole Jazz Band and included Louis Armstrong on trumpet (now replacing the cornet), Lil Hardin Armstrong on piano, Johnny Dodds on clarinet, Kid Ory on trombone, and Johnny St. Cyr on banjo. There were no drums and bass because the Okeh recording label was still recording acoustically in 1925 and the drums and bass could not be well recorded. By 1927 they were recording electronically and the Hot Five had increased to seven with the addition of drums and bass. The recordings of this studio group are collectively know as "The Hot Fives and Hot Sevens". These are widely considered to be the most important recordings in jazz history. Satchmo had already had a huge impact on trumpet playing; on swinging the beat; and on infusing more blues into the music. Solos up until this point were breaks in group playing and were embellishments on the melody. These recordings were a continuation of prior group improvising jazz, but with a fundamental shift. Armstrong dominates the recordings. No longer are solos brief and the group paramount. His trumpet playing dominates and he recomposed the songs as he played, no longer merely embellishing the melody. Kid Ory on trombone and Johnny Dodds on clarinet were top rank professionals of the time. Armstrong's playing soared far beyond them. They were tied to the ground beat and Satchmo crossed bar lines, sped up and slowed the tempo and created beautiful, memorable melodies at every opportunity. Critic Gary Giddins states that Armstrong would be the most influential figure in jazz history if he had never recorded after the Hot Fives and Sevens. In "Potato Head Blues" we can hear traditional New Orleans ensemble playing by everyone except Armstrong. The piano and banjo are tied to the ground beat. Johnny Dodds solos nicely with a strong blues feeling but also sounds dated and corny by staying right on the downbeat - even in his short stop-time solo late in the song. The contrast with Armstong's playing creates a window showing the past and the future of jazz at the same time. Satchmo's playing has now blossomed and he easily swings the rhythm to and fro on his trumpet. He paraphrases the melody - creating new melodies that are much more beautiful than the original. His remarkable stop-time solo near the end of the song reaches new heights of rhythmic variation with blues feeling and spontaneous, melodic invention and does not sound dated even today. We hear the future of jazz. "West End Blues" in 1928 shows jazz changing. The clarinet is more supple and less rigid. Earl "Fatha" Hines is now on piano and we hear an Armstrong-esque swing and variability on keyboard. The opening trumpet cadenza is breath-taking and Satchmo's vocal response to the clarinet's call in achingly beautiful. "West End Blues" is a masterpiece. In 1929 Louis Armstrong returned to New York. Among songs he recorded that year was a song by Fats Waller - "Black and Blue" and Hoagy Carmichael's favorite version of his song "Stardust". Armstrong's playing with big bands was the beginning of what became big band swing. Until 1946 he mostly fronted big bands playing trumpet and singing. After 1946 until weeks before his death in 1971, Louis Armstrong played again with small combos. His playing and singing matured even more and he was almost constantly on the road playing one nighters and bringing great jazz to audiences all over the country and the world. His seminal innovations had been mostly accomplished by the early 1930s. Satchmo remained a trumpet virtuoso, cultural ambassador and popular superstar. If anyone was ever the King of Jazz, it was Louis Armstrong. The Hot Fives & Hot Sevens 1925-1927 - "Beyond indispensable" The most important recordings in jazz history and beautiful music.